I just finished reading William Morris, craftsman – socialist. It’s a short book about the life of William Morris. I never knew who William Morris was before picking up this book almost by accident as I was strolling thru a folksy section of the library where I work. The most interesting thing in this book for me was Morris’s ideas about work. He felt that all men should have the freedom to pursue meaningful work, work they could take pride in, work that made them feel like artists instead of assembly line workers. These are thoughts and ideas that resonate in today’s world. But he lived during the late 19th century. He despised the industrial revolution and felt that men’s lives, and the products they produced, were being degraded. 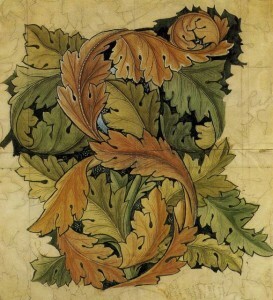 Morris was an artist himself. He loved medieval stuff, book-binding, writing, making tapestries (! ), and anything hand-made and crafty. I’d like to invite him over for dinner. As I read the book and his thoughts about work, freedom, equality, and art, I couldn’t help but think about my last 7 years of work. In December, I started a full-time regular job at the BYU library. For the previous 7 years I was totally self employed doing all kinds of random things. Some of them were artsy, some just helped pay the bills. There was freedom and solitude, but also lots of stress; definitely a mixed bag. I wonder how Morris would have seen this period of time in my life.